Perennial herb from long rhizomes; stems erect, 30-60 cm tall. 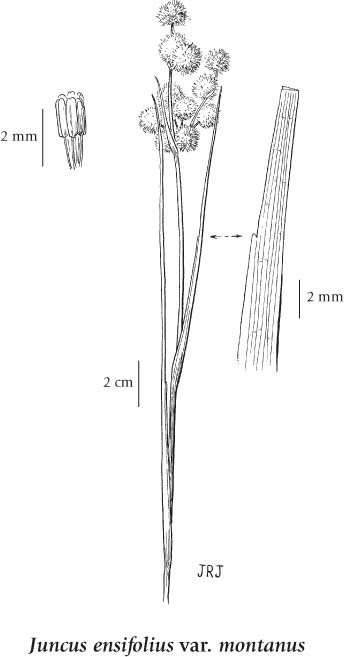 Located on the lower half of the stem, strongly flattened, compressed laterally (iris-like), with partial cross-walls that run from the edges to about 2/3 of the leaf widths; sheaths open, with or without short, ear-shaped lobes. Inflorescence terminal, with 1 to 10 heads, the heads globe-shaped, 5- to many-flowered; perianth segments greenish-brown to brownish-purple, 3-4 mm long, pointed, subequal; stamens 3 or 6; anthers 0.7-1 mm long, shorter than, or equal to the filaments. Capsules, narrowly cylindrical, rounded, blunt, about as long as the perianth segments; seeds egg-shaped, about 0.5 mm long, lacking tail-like appendages. 1. Heads 5 or more, pale brown; stamens 6; blades 2-4 mm wide, sheaths with ear-shaped lobes............................. var. montanus (Engelm.) C.L. Hitchc. Wet, open, sandy soil in marshes, peat bogs, lakeshores and margins of creeks and rivers, from the lowland and steppe to subalpine zones; frequent in BC south of 55degreeN, infrequent N; amphiberingian, N to AK and YT, E to SK and disjunct to ON and PQ, and S to CO, AZ and CA; E Asia. A very shade-intolerant, submontane to sub­alpine, Asian and Western North American rush (uncommon in the Central region). Species occurs on very moist to wet, nitrogen-medium soils within subalpine boreal, temperate, and mesothermal climates. Common and often dominant in early-seral communities on water-receiving and water­collecting sites with exposed and compacted mineral soil and a fluctuating groundwater table. Frequently associated with Carex species Deschampsia caespitosa and Scirpus microcarpus. Characteristic of waterlogged sites. Juncus ensifolius var. major Hook. Juncus xiphioides var. triandrus Engelm.